IBM has launched something they call the Domino Tech School. This is a series of webinars where you will learn all the cool, new and severely useful stuff in Notes/Domino V10. Every course (webinar) consists of 60 minute sessions, that will be held twice a month. They are especially geared towards both developers and administrators. The topics will be based around the feedback received from the participants, but the general subjects have been set. Every course will be lead by the biggest experts on the subjects that will be presented. The presenters will not only come from IBM and HCL. There will also be IBM Champions, Business Partners and customers leading the classes. And if you should miss one class, recordings will be available here. The first webinar will be held already this Thursday, January 24th at 16:00 GMT+1. 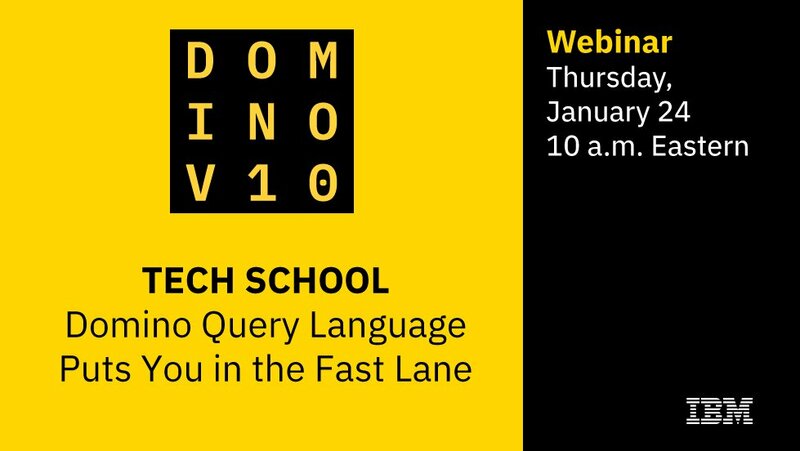 You will learn about the most impressive of the new technologies in Domino V10, namely Domino Query Language (DQL). This language is available for developers of Node.js, LotusScript and Java. In this webinar you will learn how to get started. And you will also be given a deep dive into the technology behind DQL. DQL makes it possible for you to run queries and present search results much, much faster on Domino, than you can with views and good old fashioned database searches in LotusScript. You can register here! My colleagues and me have already registered, and we have ordered pizza, and are ready for an after work fun fest of DQL. See you there?